Swetha Srikanth is a grade 11 student at O’Neill C.V. I. and this summer she completes her placement with the RMG. She sat down with the RMG to discuss her experience at the gallery this spring. The RMG: How did you get involved with volunteering at the RMG? Swetha: I got involved with the RMG through the co-operative education program, which is an amazing opportunity that I got through school. I was interviewed last year and started my placement this February. I was familiar with the gallery before then, but working here for the past five months has really allowed me to fully appreciate and learn about the many areas of this gallery. The RMG: Why were you interested in volunteering in an art gallery? Swetha: I was interested in this placement specifically because it relates to the work that I would love to do in the future. I have always been passionate about visual arts, and am hoping to become an interior designer and manage my own design firm. This environment has allowed me to start to understand how businesses work. The RMG: What have you been doing during your placement at the gallery? Swetha: I started working with Norah O’Donnell in February and Carla Sinclair in the past few weeks. I have done so many creative and administrative tasks to help improve the system that is in place for the volunteers, as well as provide services for the public through event preparation and RMG Shop management. The RMG: What is one thing you want to share about the RMG? Swetha: The sense of community within the workplace. The employees are extremely welcoming, positive, and show appreciation to the other workers and volunteers. There were many collaborative tasks that I was involved in, which made me feel like a part of the community. They also allowed me to feel comfortable and be seen as a co-worker, rather than a high school student. The RMG: What is your favourite museum? 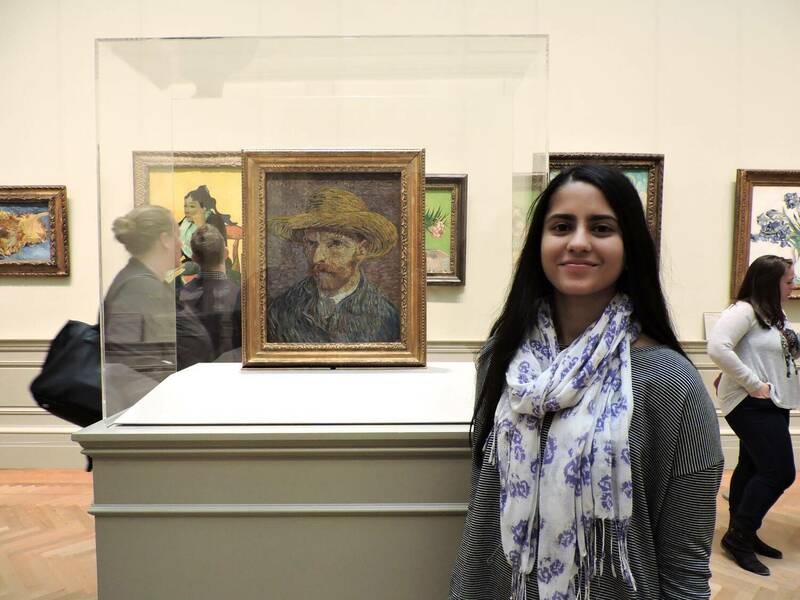 Swetha: I’m not sure that I have a favourite place, but one of my favourite memories is when the Specialized Visual Arts Program at O’Neill took a trip to Buffalo, NY and visited the Albright-Knox Art Gallery. It was the first time I was with some of my best friends and had the opportunity to experience incredible artwork and discuss it with them in depth. It was nice to be around likeminded people while visiting a new gallery, and I’m really glad that I have experienced that feeling multiple times since then. The RMG: What is your first memory of art? Swetha: My first memory of art is something that I remember creating when I was about four or five years old. I had painted an elephant, and I remember it being framed on the wall for people to see and feeling really proud of what I had done.